Hyderabad, India (1 June 2013) – Mr Bill Gates, Co-chair of the Bill & Melinda Gates Foundation, visited the ICRISAT headquarters in Patancheru, Hyderabad on Thursday, 30 May. This was Mr Gates’ first visit to this Institute where he held discussions with the management and several key scientists to gain a better appreciation of the foundation’s research for development investments to ICRISAT. With food insecurity and malnutrition persisting as the greatest challenges facing humanity in the coming decades, Mr Gates acknowledged the potential of ICRISAT’s works on grain legumes and dryland cereals in helping millions of smallholders farmers in the drylands of Asia and sub-Saharan Africa lift themselves out of hunger, malnutrition and poverty. 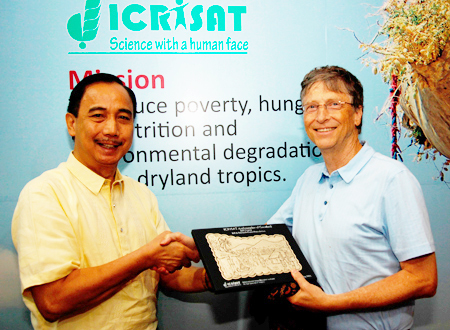 “ICRISAT crops are great – as they target millions of smallholder farmers globally,” said Mr Gates. The tour highlighted the uniqueness and importance of the works and initiatives of ICRISAT and its partners, particularly in providing modern crop improvement technologies and best management practices on once ‘orphan’ or neglected crops like grain legumes and dryland cereals. ICRISAT scientists demonstrated the different high-end sciences that the institute uses – genomics, bioinformatics, phenotyping and genetic engineering – all integrated or complementing each other as part of its crop improvement program for smallholder farming. Considered as international public goods, scientists and national partners worldwide can have free access to ICRISAT’s genotyping and phenotyping data, captured and analyzed through its work on bioinformatics, for their respective molecular breeding processes. 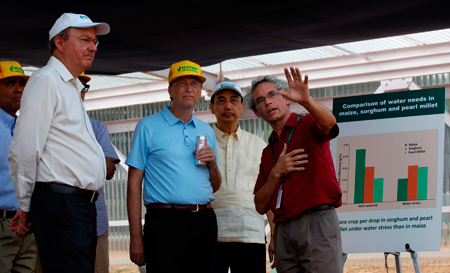 “That was cool!” was how Mr Gates reacted on ICRISAT’s lysimeter facility for phenotyping, a first of its kind in the world and the largest within the CGIAR system. The facility is now being successfully used for measuring plant responses to water stress related to drought and climate change adaptation. Legumes I & II project which aims to enhance productivity of six legume crops (groundnut, cowpea, common bean, chickpea, pigeonpea and soybean) by at least 20% through improved cultivars and management practices and the development of markets and value chains. The poor in the target areas of these two projects are the most malnourished, food-insecure in the world, unable to earn adequate incomes from agriculture which is their only source of food, nutrition and livelihoods. The impacts and achievements of these foundation-funded projects are now changing the lives of the poor, providing millions of smallholder farmers with tools and opportunities to boost their yields, increase their incomes, and build better lives for themselves and their families. Recognizing the consistent and generous support of the Bill & Melinda Gates Foundation to the institute, ICRISAT honored Mr Bill Gates as their first Ambassador of Goodwill. ICRISAT is a member of the CGIAR Consortium. CGIAR is a global agriculture research partnership for a food secure future. Showkat Nabi Rather, Media Liaison Officer, +91 40 3071 3187, R(dot)Showkat(at)cgiar(dot)org.